Thanksgiving is just a few days away! Our house is in full prep mode - the hunting and gathering process has begun. We hunt and gather the serving pieces, table extenders, extra seating and the ever popular multiple (matching) tablecloths that are stored in the basement and/or cabinets. Am I the only person who irons tablecloths anymore? Talking with my co-workers, I discovered most people don't even bother. I find it VERY necessary..... I guess I'm a dying breed. We are attached to our ever popular checklist: we are adding things as we go and crossing them off as they are completed. There is something to be said for physically crossing off an item on the To Do list. As I type this, Jon is in the midst of mowing our lawn for the last time of the year. He has announced that after the lawn is complete he will be rearranging the garage to make room for the snow blowers, as there is a prediction for snow this week! Ugh. Now? Already? Our guest list of 10 for Thanksgiving may end up as a party of 3. On to a little crafting.... I decided this year to change up my place cards. As you know, I'm a huge fan of them and find they calm the chaos just as the cooking has finished and guests move to the dining room. 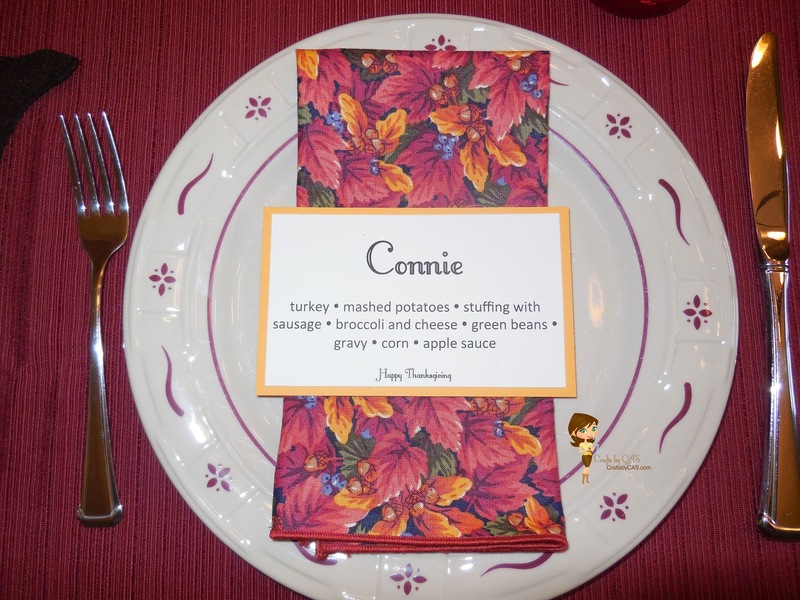 It appears I have a creative block with how to change it up, so I finally decided to combine the menu and place cards. As usual, I created them in PowerPoint and printed them out.